First of all, shout out to ERIN!!! I am so excited she asked me to share!! I love Erin’s blog. In fact, it is the first blog that I subscribed to- and I have never stopped it coming into my email:-) I am a little jealous that she is going on a baby moon. I never did that, and 16 years later, I wish I had. Haha! 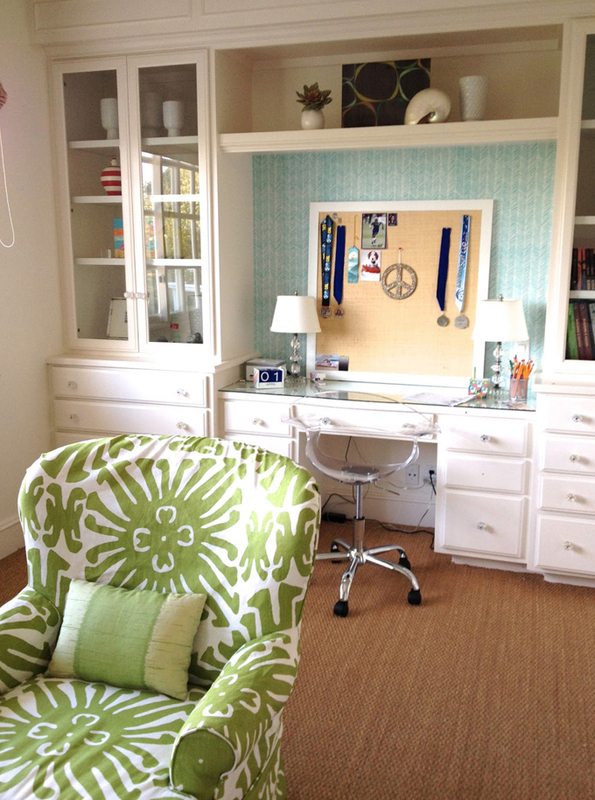 Below, I will share some photos of a room I recently installed for a 10- year-old girl. She is one of four (2 girls and 2 boys) and her older sister already had a gorgeous headboard, so we couldn’t compete. 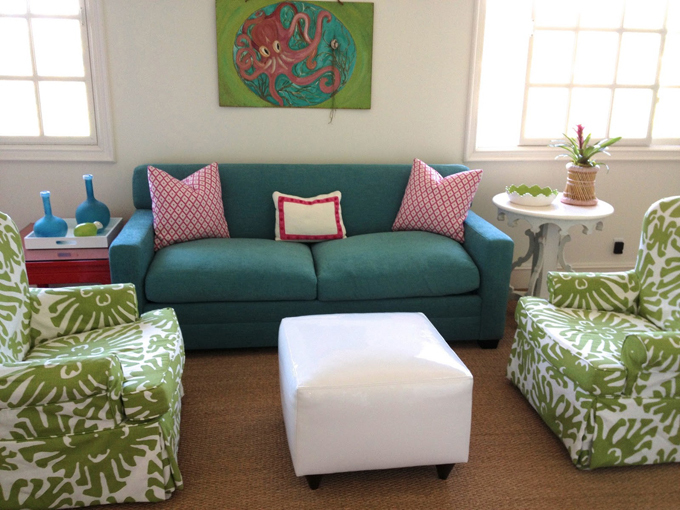 The great thing is that her sister chose lavender and lime green so my client had TURQUOISE and fuchsia all to herself. 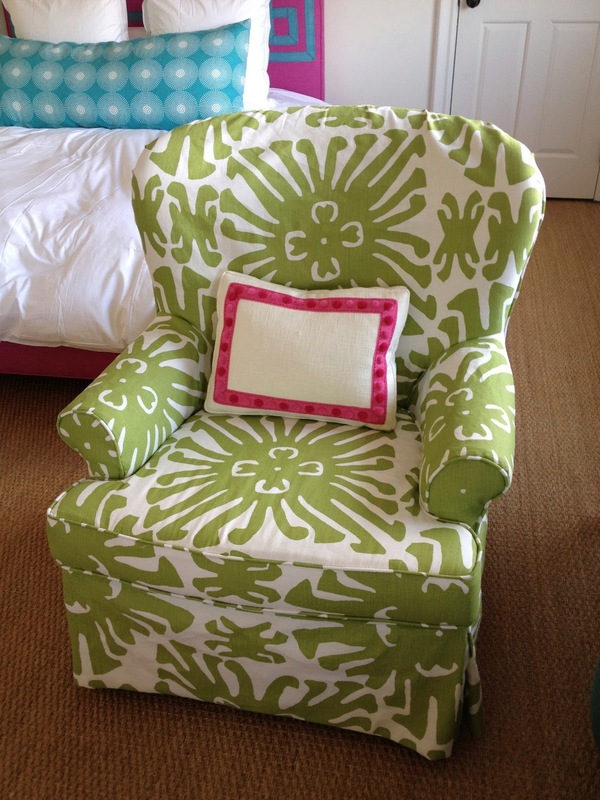 We did bring in the lime green so that the rooms can relate to each other- Hi sister’s room! I don’t have many clients who choose such a fun palette. The mixture of such strong and vibrant colors was a wonderful balancing act. It could have been a cacophony, but I think grounding the room with gobs of white helped. The room is such a happy room, I can’t stand it! Just like the reveals on HGTV, I was there when she saw the room. Her smile lit up her entire face and I was so happy and relieved:-) Even with a 10-year-old client, I manage to worry about the reaction! Enough chatting, here are some project pictures. 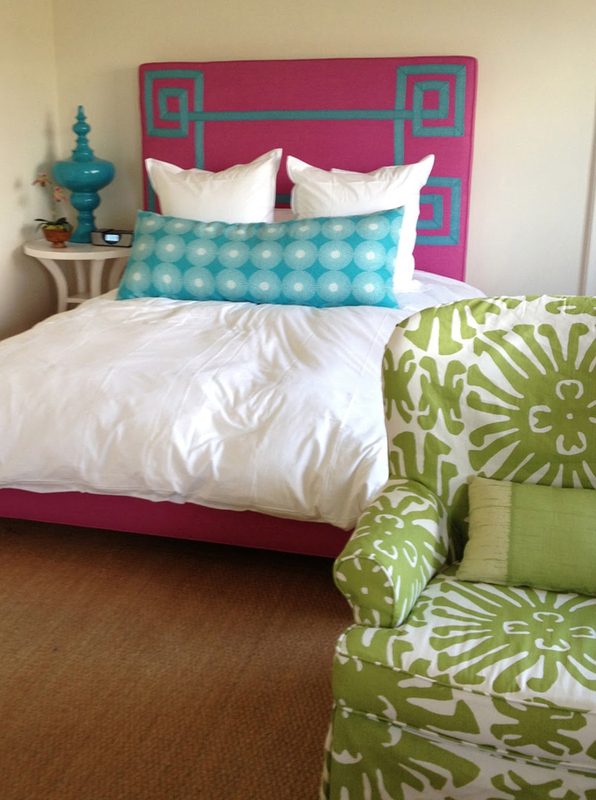 I adore the new fuchsia bed that I had made. Finding the turquoise tape in the correct width was a project, but worth the toil. 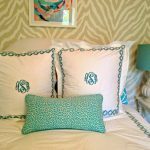 The turquoise pillow is made from a new Jonathan Adler fabric. The sofa is a sleeper and was re-incarnated as a modern sofa with square arms. You should have seen it before!! It had a heart shaped back and rolled arms. Nothing a little elbow grease couldn’t change:) I say elbow grease and I don’t mean my greasy elbow! 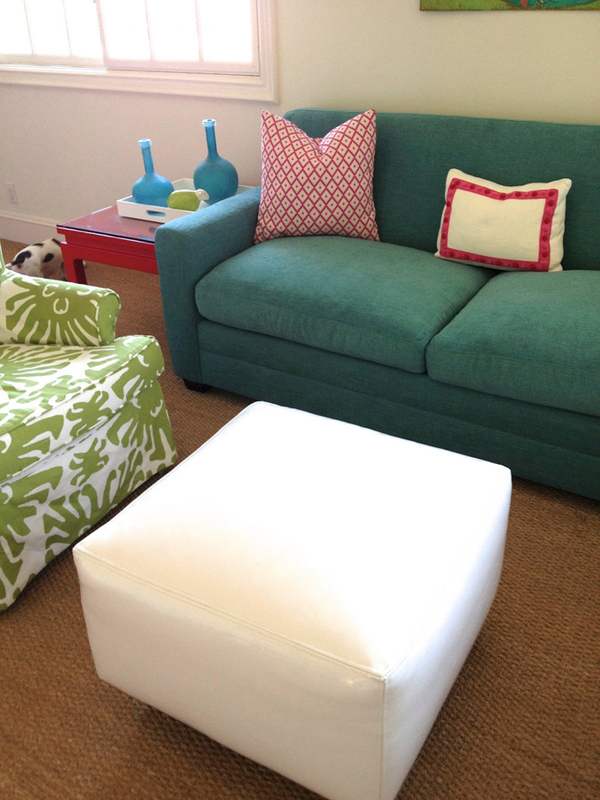 My upholsterer is a magician and he can do whatever crazy thing I come up with. I had 3 little tables sprayed white and they became fresh again. The white looks so great against the wing back chairs that are covered in this stunning Quadrille fabric. The scale is large and perfect for the wings. I also (OK, had my magician) cover the chairs with a potion that repels spills. “Ahh.” That is a quote from her mom. 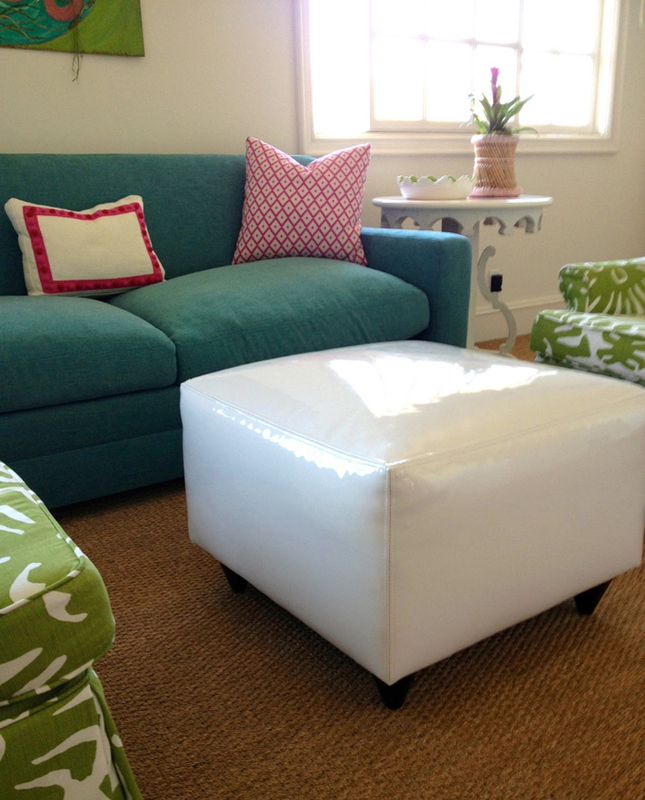 I also had an ottoman re-upholstered (OK, taken apart, gutted and re-made) in white patent leather. It is bullet proof. Can someone gut me and re-make me?!? I digress. West Elm has some cute turquoise glass pieces and I put set them on a white lacquer tray next to the lime green lamby bank. Is that the word for a piggy bank that looks like a lamb?? I put lamby on this table to take a picture so you could see it better. Did you see the Quadrille Zig Zag patent leather wallpaper behind the bulletin board? This was left over from my master bathroom. 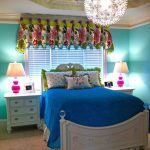 It brings the turquoise to the other side of the room. And, yes, I said patent leather. It is shiny and bounces light all over- just like the white patent leather ottoman. The little acrylic wheelie desk chair is fun too. I went up and down on it. Yes, I am the same height as a 10-year-old so I just had to adjust everything to my size! Anyhow, I hope Erin has fun on her trip. I am excited to see her guest blogger’s photos! Thanks for letting me share this room, Erin!! « My Mother-in-Law’s Visit to Tybee Island! Kathleen, this is fantastic. What a lucky girl. The room is full of cheerfulness. Such a lovely & lively space. You are so talented, Kathleen!! I always love everything you do! What a lucky lucky girl!! Great job! 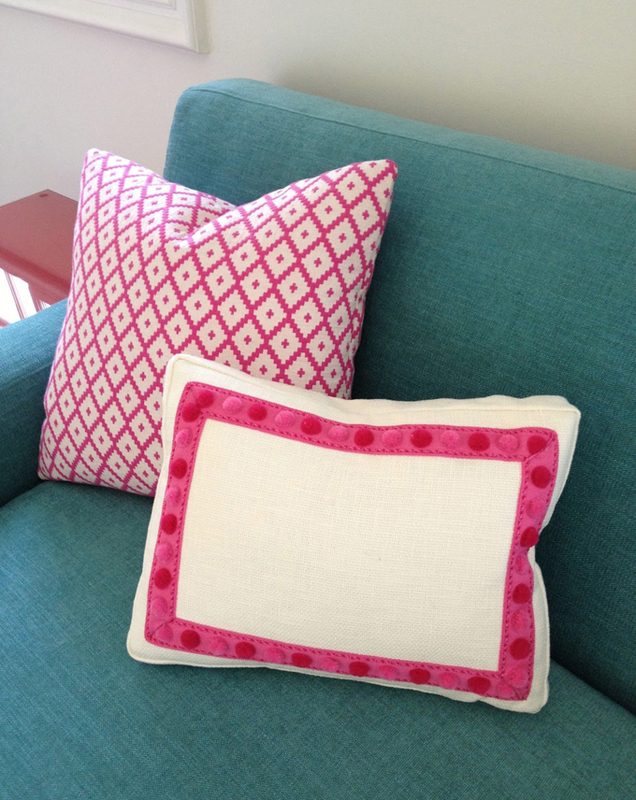 I have a fushia and chartreuse kids project going on right now, and LOVE how unafraid of color some clients are! 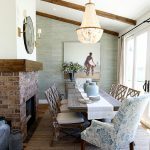 This room is so great- love the quadrille chairs! What a lovely room. Nice job. What a fabulous space! The colors are so cheerful. 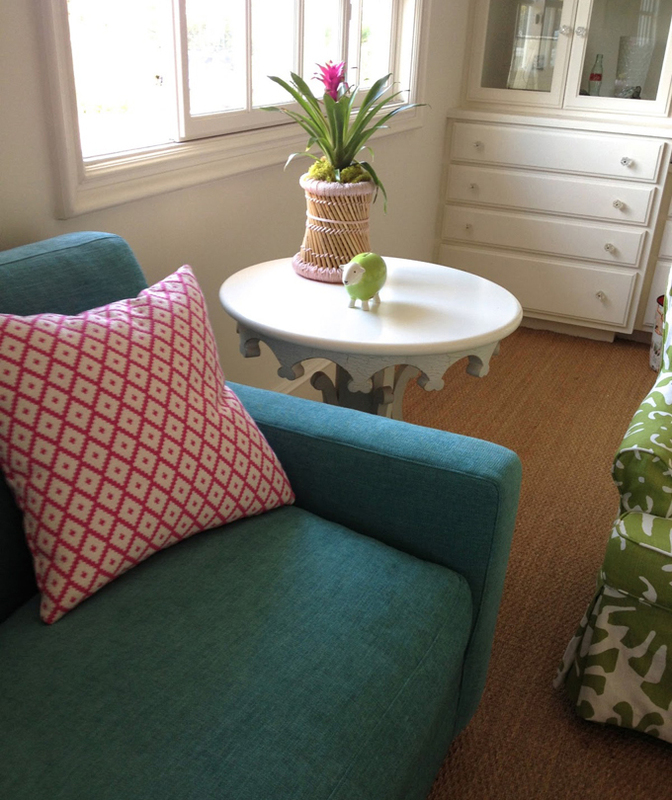 Love all the fabrics you chose. Great job! I would give this room an A++++. Absolutely wonderful job Kathleen. What a lucky little girl. what a beautiful house it is. I just loved your house because your interior are superb and furniture gives extra edge to your house. Awesome house.